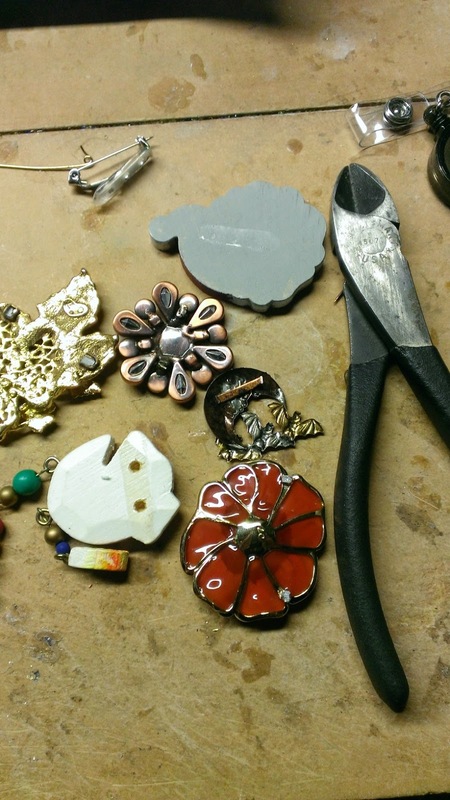 Easy way to make a Badge Holder a piece of jewelry. I work at our local hospital and I must wear a badge at all times. This morning I was was organizing my outfits and I thought gosh I am so sick of wearing a plain badge holder. Since I am such a recycle nut I thought I would take some old pins and give them a new life. Super easy to do. 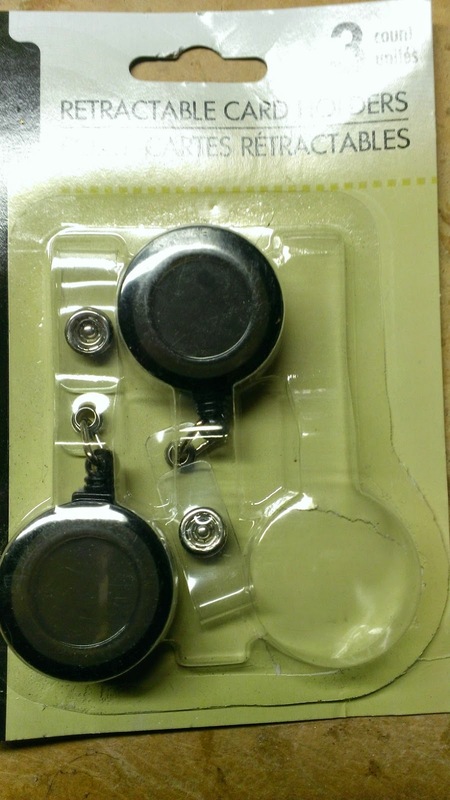 I bought badge holders from Dollar Tree. I then took old pins - removed the pin part on the back - then glued the pin to the holder using E6000 glue. 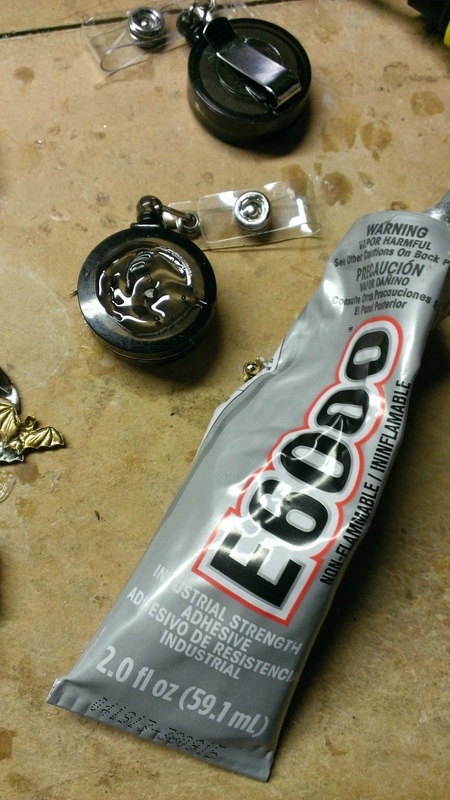 E6000 glue takes a while to dry - make sure the pin is centered and you have something to hold the pin in place while it is drying. 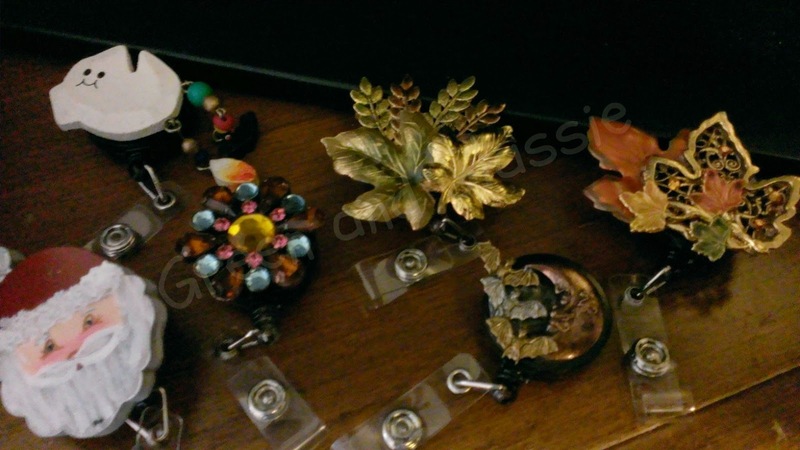 The pic with the finished pins - I am using the base of my bedroom TV to hold the pins in a straight position while they are drying so I could take a pic for this post. Not bad - 6 new Badge Holders for $2.00 plus glue! :) If you wear a badge everyday at work - the next time you are at Rummage Sales and see a neat pin. Pick it up and make yourself a fun badge holder. Those badge holders came out so pretty! I would have never thought to make my own with special decor like that! Those would be fun for a conference! I'm not that creative! These are so cute! My roommate is an OT who wears a badge every day so I know she would love this! That is such a cute idea! And original, I have never seen it before, but then again, I am no expert. Thanks for sharing this cool creation! I think this would be a great idea for a teacher... especially holiday-themed ones! Thanks for sharing how to make them! This are so great! This would be something wonderful to do for my kids during the holidays. Very neat! This could be the perfect teacher gift for kids to give. It also looks really easy. My husband has to have badge holders for his work at the hospital. I bought him a Captain America one off Etsy. Would be nice to make my own. Thanks. These are super cute! I used to love decorating my badge reels when I was working at the hospital. oh how fun. these would be great gift ideas too! What a fun idea. I would not have thought to make such a cute badge holder. Very cute and creative. I love that you can have one for every season and holiday! These are so cute. I used a badge everyday for the last three years for University. I graduated last month so I no longer need one, but I would definitely keep this in mind should I ever find myself once again requiring a badge. Love your seasonal badge holders. I can think of a lot of people to make these for as gifts for the holidays. Thanks for the easy tutorial.